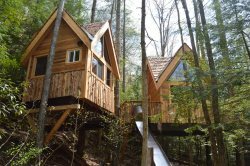 *NEW* The Tradewinds Treehouse: our newest Adventure. Tall Timbers is accessible by road and is situated next to a stream-fed brook and so is the perfect retreat from the rigors of city life. The cabin has two stories: the first story contains the kitchen, bathroom and living room, while the second floor has two bedrooms. Tall Timbers cabin can sleep 6 comfortably: a queen size bed in the 1st bedroom, 2 single beds in the second bedroom, and a full sized futon in the living room. Tall Timbers cabin is located alongside Route 77 (Nada Tunnel Rd) in the Red River Gorge geological area, and is perfect fit a family, or multiple couples. Enjoy relaxing in the heart of the Red River Gorge Geological area and step out your front door onto miles of trails with spectacular views. Tall Timbers cabin has immediate access to Trail #221, the Rough Trail, from the Martin’s Fork parking lot. Kitchen: Full kitchen complete with gas stove and oven, compact refrigerator, double sink and coffee pot. Cookware, dishware, soap and kitchen linens are provided as well. Living/Dining: The main room has a large kitchen table and two couches. There is also a covered porch with seating. Bathroom: Full bathroom with sink, toilet and shower. Additional Amenities: Weber charcoal grill, wall heater, window AC and box fan, TV (DVD only), and private fire pit. Firewood is also available upon request. For $20 we will deliver firewood (sourced on-site) to your fire pit. Please be sure to mark on your reservation if you would like firewood delivery. Please be sure to put out all fires COMPLETELY when you are finished.